The Certified Professional in Training Management (CPTM™) program utilizes a blended approach to learning, providing the right amount of self-paced prework combined with applied experiences, to enable a lasting and impactful transformation of the business practices associated with managing learning and development. Once you’ve registered and chosen a practicum date, there are three steps to attain certification. After you register, you will receive access to the learning management system (LMS) where you will complete ten online modules. The practicum, completed virtual or in-person, is a team-based experience designed to simulate the real-world events of a training manager. Teams are confronted with a real-world business problem and asked to conduct diagnostics to identify the root cause of that problem. Together, your team will develop a solution using learning and development and identify appropriate success metrics to evaluate that solution. By the end of the program, you will have developed a plan of action that aligns your training goals with the goals of the business you support. Each practicum will include a keynote discussion with an experienced training executive, who has faced many of the challenges you face in your company. To view upcoming practicums, please visit here. Successful completion of the CPTM exam is your last step in achieving certification. The two-and-a-half-hour online exam can be accessed at any time following the completion of your practicum. The exam consists of 100 multiple choice questions designed to test both your knowledge of the core principles needed to effectively manage corporate training programs and your ability to apply best practices in various training manager scenarios. Candidates must receive a 70 or higher to pass the exam and earn the CPTM credential. Upon passing the exam, you will receive a CPTM certificate recognizing your achievement as well as a social badge through Acclaim designating your credential. CPTM graduates are admitted into an elite alumni community of learning and development professionals, affording you the opportunity to learn from and network with your peers. You will also gain access to exclusive opportunities for continuing education including CPTM webinars, virtual roundtable discussions, conferences and more, all of which contribute to your recertification requirements. 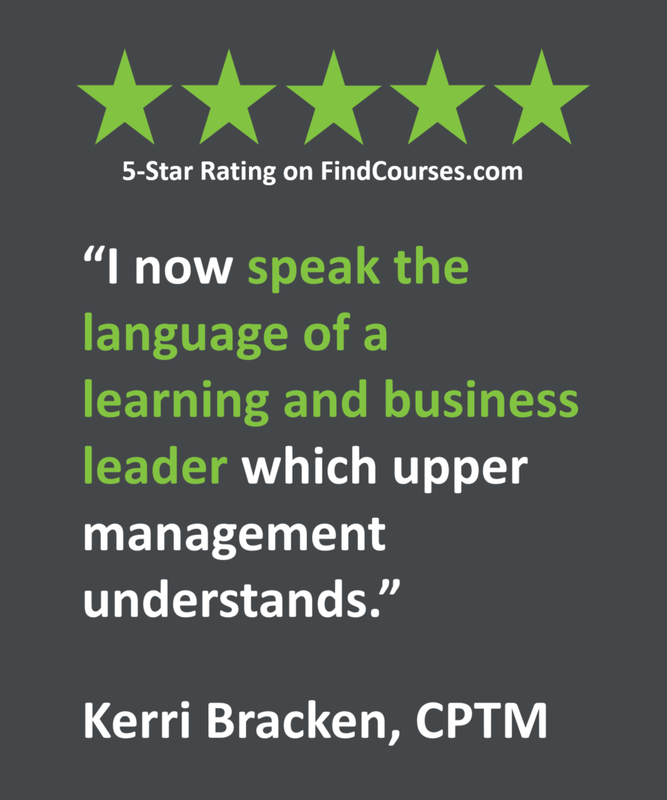 Learn more about the benefits of becoming a CPTM alumni here. Recertify by completing at least 24 hours of continuing education within a two-year period. CPTM recertification reinforces the value of continuous learning and skills development to effectively manage the current and future training needs of your organization. Click here to submit your application for CPTM recertification. Register now to start the process of becoming a Certified Professional in Training Management. If you would like a more detailed overview of the CPTM training program, click below to receive a copy of the CPTM Candidate Guide that outlines the process from registration to recertification.